Be prepared for a multi-layered film that reaches out and dares you to examine your own upbringing and core value beliefs. Also be prepared for a seriously funny film! Writers and directors Joel and Ethan Coen bring a personal examination of their Midwest childhood and Jewish rearing to the silver screen. The lead is played by a gifted Broadway actor, Michael Stuhlbarg who carries the film and is so convincing in his role you may actually feel his pain. His portrayal is brilliant! The well crafted script is wacky as expected and the character development of physics professor, Larry Gopnik, (Stuhlbarg) is superb. The Academy Award winning Coen brothers and I go back to their first feature film, Blood Simple (1984) of which I was introduced to the brothers by my own ‘film critic’ brother, Richard Knight. At the time, it was not one of my favorites (seemed more like a Quentin Tarantino film) however; their next film, Raising Arizona (1987) is in my top ten all time favorite comedies. Nic Cage and Holly Hunter as ex-con and ex-cop are two of the craziest film characters ever created! If you haven’t seen it I strongly suggest you check it out. 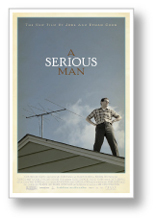 A Serious Man starts with a Yiddish-speaking parable accompanied by characters in biblical dress. After this unique opening, you knew you were in for a different kind of film. It is 1967 in a suburb outside of Minneapolis, where we are introduced to Larry Gopnik and his family. By all appearances, Larry, a respectable college professor, seems to have a normal family, two kids that argue and a wife that keeps an orderly home; but nothing could be further from the truth. Larry’s odd brother Arthur (Richard Kind) has been living in the spare bedroom and we’re not sure for how long other than the fact that Larry’s wife has become totally annoyed with him. We also learn that Larry’s daughter steals money from his wallet and his son steals money from his sister to buy marijuana. Out of the blue, Larry’s wife, Judith (Sari Lennick) declares that she wants a divorce because she’s fallen for another man; Sy Ableman (Fred Melamed) who’s a real ‘schlep’ of a guy. In the next scene, Sy and Judith meet with Larry at a local restaurant to inform him that he should move to the Jolly Roger Motel. For Larry, the rest of the film goes downhill from here with the exception of a sensuous meeting with his exhibitionist next-door neighbor, Mrs. Samsky (Amy Landecker, daughter of Chicago radio legend, John “Records” Landecker). Larry’s world turns upside down and to make matters worse, a student tries to bribe him into changing a failing grade. At this point (one of my favorite scenes), Larry looses his cool and shouts, “I didn’t leave anything, I know exactly where everything is!” He’s referring to an envelope full of 100 dollar bills that magically appears on his desk. The script is so well written that we know Larry would never take this bribe nor change the student’s grade and to even suggest that he would is totally out of character. It’s a memorable scene. In an attempt to make sense of the abrupt changes in his life, Larry seeks meaning to his circumstances and visits a rabbi. This practice continues and he actually visits four different rabbis throughout the film. We are given a glimpse into the Jewish faith and can easily make a connection regarding our own faiths while viewing these scenes, which I found enlightening. The musical score is wonderful and sets the tone for each scene. The 60s tune, “White Rabbit” blares in the background as does Jimi Hendricks’s guitar. The camera angles and cinematography are powerful. Each relates to the scene at hand and sets the stage for the moment with perfection. These are seasoned filmmakers to be sure. Larry is a serious and good man who has had an unfortunate state of affairs. He can’t believe what has happened to him and yet he yearns for answers. He does discover that perhaps he should have paid more attention to his children and not been as submerged into his job as those moments can never be regained. Is there a lesson for us here? Are there under lying layers to this film? Yes, most definitely yes. As a film reviewer I was extremely pleased that a Q&A session was offered after my screening and that much of the film was examined although not necessarily explained. This film and your personal connection to it will be very different from the person seated next to you in the theater. And that’s a good thing because afterwards you can go for cocktails and discuss away! If you’d like further lucidity, visit my audio interview with actor, Michael Stuhlbarg. I plan on viewing this film several more times in an attempt to reach clarity in my own mind.